This Louisiana favorite is made easier by utilizing your crock pot, to make it even simpler you can prepare this recipe through step 2 and refrigerate the mixture overnight, reheat in the morning (the mixture will have solidified) and add to your crock pot. 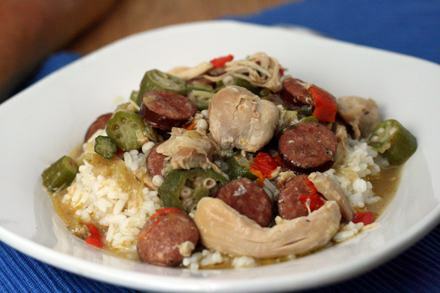 Just like traditional gumbo, this recipe includes seafood and poultry with sausage and is flavored with a dark brown roux. Roux is nothing more than flour cooked gently in some type of fat to form a paste that is used to thicken sauces. 2. Stir in the onions, bell peppers, celery, garlic, thyme, 1 teaspoon salt, and cayenne and cook, stirring often, until the vegetables soften, 10 to 12 minutes. Stir in the chicken broth in a slow, steady stream. Increase the heat to medium-high and bring the mixture to a simmer. 3. Once simmering, transfer the mixture to the slow cooker and stir in the sausage, okra, Rotel and bay leaves until evenly combined. 4. Season the chicken with salt and pepper and nestle it in the slow cooker. Cover and cook on low until the chicken is tender, 4 to 5 hours. 5. Remove the chicken to a platter and let cool slightly. Let the cooking liquid settle for 5 minutes, then gently tilt the slow cooker and remove as much fat as possible from the surface using a large spoon. Using two forks, shred the chicken, discarding the bones and fat. Remove the bay leaves and stir in the shredded chicken, scallions, and parsley. Season with salt and pepper to taste before serving. Serve with rice. 1. Preheat oven to 350°. Combine first 8 ingredients and 1/4 cup brown sugar in a medium bowl just until blended. Place mixture in a lightly greased 11- x 7-inch baking dish, and shape mixture into a 10- x 5-inch loaf. 2. Bake at 350° for 1 hour. Remove from oven, and drain. 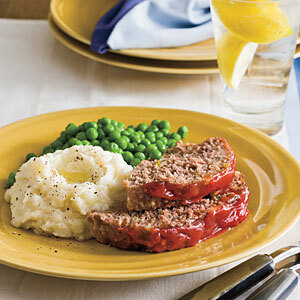 Stir together ketchup and remaining 1/4 cup brown sugar; pour over meatloaf. Bake 15 more minutes or until a meat thermometer inserted into thickest portion registers 160°. Remove from oven; let stand 20 minutes. Remove from baking dish before slicing. The slow-cooker simmers chicken, potatoes, carrots, and celery in a creamy sauce and is topped with tender dumplings made easy and delicious with baking mix.